FILE - Schoolchildren hold banners to express their distress at the alarming levels of pollution in the city, in New Delhi, India, Nov. 15, 2017. India should follow China's example and clean up the air in its cities, which are among the world's worst for outdoor pollution, the World Health Organization said Wednesday. Chinese cities such as Xingtai and Shijiazhuang and the Saudi refining hub at Jubail were also highly polluted, but the data for those places was 4 to 5 years old, and Maria Neira, WHO's head of public health, said China had made big improvements that India should follow. "There is a big step at the government level [in China] declaring war on air pollution," Neira said. "One of the reasons for that is that the health argument was very strongly presented, and the fact that the citizens were really breathing air that was totally unacceptable." 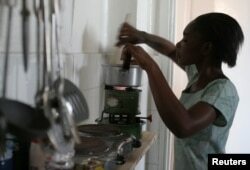 FILE - A Tanzanian woman uses a kerosene stove to prepare a meal in the capital Dar es Salaam, Sept. 28, 2006. "The transition to clean fuels and technology in the home, clean household energy, is too slow. It's been three decades and we still have three billion people primarily relying on [polluting] fuels and technologies, and that's for cooking alone," said WHO technical officer Heather Adair-Rohani. "The data we are presenting today is, I think, the most accurate you can expect at the moment," Neira said.